I just spent a few enjoyable minutes doing some online window-shopping for sweaters and autumn accessories; it's almost September, after all, and what better time to fantasize about a new pair of boots? This is the moment when I also start thinking about switching my summer perfumes (fruity roses, sheer beachy blends) for spicier, richer compositions. Fortunately, I have on hand small samples of two appropriate fragrances from French niche line Olfactive Studio: Close Up, launched in fall 2016, and the recently released Woody Mood. Close Up was developed for Olfactive Studio by perfumer Annick Menardo and (as is customary for the brand) was inspired by a photograph: a very close view of an eyeball's iris by Suren Malvelyan. It features top notes of green coffee, spices and cherry; heart notes of white tobacco, patchouli, cedar and rose centifolia; and base notes of amber, musk and tonka bean. This fragrance is supposedly to evoke "oscillation between opposites." I'm honestly not sure what that means, but I've been enjoying Close Up. On my skin, it starts off with a diffusive, cocoa-kissed coffee accord. There's lots of woody-sweet pipe tobacco in the heart, with dried-cherry notes, and more coffee and some warm patchouli; then an appearance by the rose note, which marries surprisingly well with the coffee and tobacco. Close Up gradually develops (photo pun intended!) into a subtle vanillic amber that stays closer to the skin. I've tried and enjoyed a range of coffee-inspired fragrances over the years, from Diptyque Florabellio to Jo Malone Black Vetyver Café to House of Cherry Bomb Coffee Amber Vanilla, and apparently it's still an idea that appeals to me. This one kept me coming back for more, just like my craving for a second cup of morning coffee. 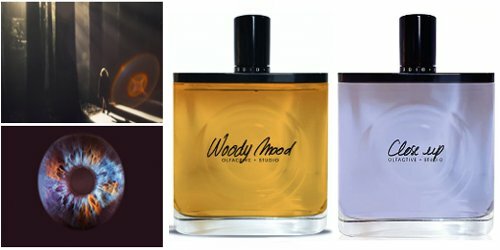 Meanwhile, Olfactive Studio's latest release is Woody Mood, a "bewitching and intense" scent that "features strong tones that echo the immensity of the giant sequoias." It was developed by perfumer Bertrand Duchaufour and its composition includes notes of bergamot, ginger, clary sage and saffron; sequoia accord, jatamansi, black tea and incense; patchouli, styrax, leather and cocoa powder. The photographic inspiration for this fragrance was Roger Steffens's 1973 photo of a woman strolling in a California redwood forest lit by shafts of sunlight. And you do indeed get lots of wood here, as the name suggests. On paper, it reminded me of a bonfire. On my skin, it was very different: lots of oak-y, boozy wood, with drier spice notes sprinkled throughout. There's a burning-rubber note in the heart (more pleasant than it sounds!) that again makes me think of an open wood fire, but it doesn't dominate for long. Woody Mood gets more and more aromatic as it clings to my skin and its incense-y side and its patchouli emerge. I'm trying to remember which belief system tells us that a tree encompasses all the natural elements; in any case, with the "trees" of Woody Mood we can experience earth, fire, and smoke all in one fragrance. Duchafour has developed wood and/or incense fragrances for many niche perfume lines (Comme des Garcons, L'Artisan Parfumeur, Aedes de Venustas, etc., etc. ), and if you're fond of his wood/incense creations, you'll very likely enjoy this one. When Robin announced Woody Mood back in July, one reader remarked that an advance sniff had revealed it to be "nothing groundbreaking." I'd venture to suggest that we're so accustomed to well-made wood/incense fragrances partly because Duchaufour himself established that trend more than a decade ago. In any case, although Close Up is more "me" than Woody Mood, and neither of them will unseat Lumière Blanche as my favorite from Olfactive Studio, both of these scents are worth considering for fall. Olfactive Studio Close Up and Woody Mood are each available as 50 ($145) and 100 ($195) ml Eau de Parfum. For purchasing information, see the listing for Olfactive Studio under Perfume Houses. Sadly we don’t have this brand in Denmark, so I’m gonna browse areound and see if I can find something incense/woody perfume that would be perfect for fall. Yes! It’s almost time for fuzzy sweaters and earthy-smelling candles! I hope this brand will reach you soon. I think you’d like some of its scents. They’re still growing! I’m loving all the coffee note scents coming out as of late! That’s a trend I can definitely get behind. Fun read! I appreciate how you compare it to other scents out there with similar notes. Me too! I love coffee candles, coffee body products (WASH WITH JOE shower gel! ), and coffee perfumes too. And actual coffee, and coffee ice cream…. you get the drift. Urgh our Sephora stopped carrying this line right before they released a coffee scent!